Scientist in japan have cloned a mouse from a single drop of blood. Isn't it amazing? Circulating blood cells collected from the tail of the mouse which is called the donor and produce a clone from it.by Riken BioResource center. 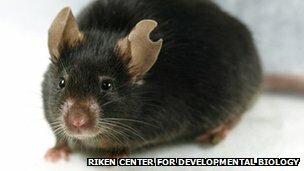 The female mouse lived a normal life span and could give birth to young, say the researchers. It seems like scientist opened a copy machine, cause they created nearly 600 exact copies of one mouse. Mice have been cloned from several different sources of donor cells, including white blood cells found in the lymph nodes , bone marrow and liver. One more amazing thing opens that cloning can also be made from white blood cells. Atsuo Ogura, of Riken bioresearchers center in Tsukuba, isolated white blood cells by pick blood from the tail of a donor, and used for nuclei for cloning experiments. The same technique produces a DOLLY ( sheep ) in Edinburgh. Transfer of nucleus from an adult body cell such as blood or skin into an unfertilized egg that has had its nucleus removed is called somatic cell nuclear transfer. They report their work ay U.S journal BIOLOGY OF REPRODUCTION. They said the study demonstrated that mice could be cloned using the nuclei of peripheral blood cells. The main reason behind this is production of high-quality animals for farming or conservation purposes. So we can make copies of copies of our hens. In this way we are being a millionaire. yahoo.. I pay a quick visit every day a few web sites and sites to read content, but this blog gives quality based articles.